From the New York Times: WASHINGTON — A military judge on Tuesday found Pfc. Bradley Manning not guilty of aiding the enemy, but convicted him of multiple counts of violating the Espionage Act. Private Manning had already confessed to being WikiLeaks’ source for a huge cache of government documents, which included videos of airstrikes in which civilians were killed, hundreds of thousands of front-line incident reports from the Afghanistan and Iraq wars, dossiers on men being held without trial at the Guantánamo Bay prison, and about 250,000 diplomatic cables. 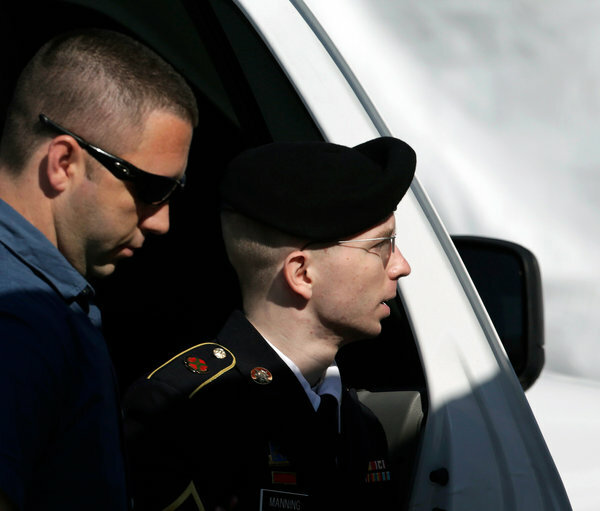 But while Private Manning had pleaded guilty to a lesser version of the charges he was facing, which could expose him to up to 20 years in prison, the government decided to press forward with a trial on a more serious version of the charges, including “aiding the enemy” and violations of the Espionage Act. Beyond the fate of Private Manning as an individual, the “aiding the enemy” charge — unprecedented in a leak case — could have significant long-term ramifications for investigative journalism in the Internet era. The government’s theory was that providing defense-related information to an entity that published it for the world to see constituted aiding the enemy because the world includes adversaries, like members of Al Qaeda, who could read the documents online. Private Manning’s court-martial began in early June, and the merits portion wrapped up last week with closing arguments in which a prosecutor portrayed Private Manning as an anarchist and a traitor who was merely out to make a splash, while his defense lawyer portrayed him as a young, naïve, but well-intentioned humanist who wanted to prompt debate and bring about change. Please note, Occupy Wall Street is claiming that neither of the two people arrested had links to OWS. However, keeping in mind the immediate distancing by OWS from the Cleveland 4, it is hard to ascertain what claims may be accurate. A link to OWS’s response is here. The daughter of a prominent New York doctor went into labor and had to rushed to the hospital when she was arrested on charges of having explosives, illegal weapons and a stack of papers labeled ‘The Terrorist Encyclopedia’ in her New York City apartment. Morgan Gliedman, 27, and her boyfriend Aaron Greene, 31, an Occupy Wall Street organizer, were taken away from their home in Manhattan’s pricey Greenwich Village on Saturday. Gliedman, who was nine months pregnant, has had her arraignment postponed because she went into labor as she was being hauled away, the New York Daily News reports. She is the daughter of a top Brooklyn cancer doctor and was educated at the Dalton School, an exclusive New York prep school attended by the likes of Anderson Cooper and Claire Danes. Greene, the father of the child, went to Harvard University for his undergraduate degree and did graduate work at the Kennedy School of Government there, as well. He was being held without bond. Also found in the living room were numerous written items containing instructions on the manufacture of explosive materials and bombs, including a collection of pages that had a cover page entitled ‘The Terrorist Encyclopedia’ and a booklet entitled ‘Deadly Homemade Weapons,’ court papers said. No political writings were discovered, and New York Police Commissioner Ray Kelly said the investigation was continuing into whether the couple had any larger plans or ties to any radical groups. They did not show up on any watch lists. Police evacuated the building and several others nearby as the bomb squad removed the highly-unstable material from the apartment. Officers also found a sawed-off shotgun and ammunition, according charging documents. Los Angeles, CA – Four men – Sohiel Omar Kabir, Ralph Deleon, Miguel Alejandro Santana and Arifeen David Gojali – were charged with material support for terrorism in Riverside County, Nov. 19. The government alleges the men were planning to join the resistance to the U.S./NATO occupation of Afghanistan. According to the indictment, evidence against the men includes postings and ‘likes’ on Facebook. The criminal complaint against the men also cites a Facebook discussion between two of the defendants, where they allegedly discuss plans of the Afghan resistance to negotiate with the U.S.
Laws covering material support for terrorism serve to criminalize opposition to U.S. wars and occupations. AKRON, Ohio (AP) — Two more defendants in an unsuccessful plot to bomb a highway bridge in Ohio have been sentenced to prison. Brandon Baxter was given nearly 10 years in prison, and Connor Stevens was sentenced to more than eight years. Earlier Tuesday, alleged ringleader Douglas Wright was sentenced to more than 11 years in prison. The 20-year-old Baxter of Lakewood was sentenced to 117 months, and the 20-year-old Stevens’ sentence got 97 months. All will be on supervised release for the rest of their lives after being released from prison. They were sentenced in federal court in Akron. For the past week, thousands of anarchists from across the world have been converging in St.Imier, Switzerland to celebrate the 140th anniversary of the founding of the Anarchist international. The gathering took the form of a festival and educational, with music, films and entertainment as well as workshops and discussions. 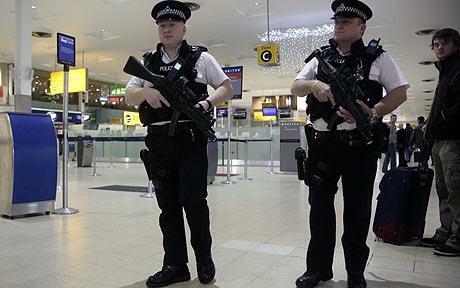 On returning from the St Imier gathering, two anarchists, one a member of the UK Anarchist Federation, were detained for nearly two hours at Heathrow by SO15 (counter-terrorist) intelligence who initially refused to identify themselves to the detainees. During the detention, the anarchists were told that their normal rights did not apply, and had their names, addresses, email addresses, DNA, photographs and fingerprints taken. The detained anarchists were also forced to sign forms – which may or may not be legal – waiving their rights to silence and a solicitor. Police also conducted a thorough search of personal possessions, photocopied literature and passports and took information from phones and cameras. During the detention, the police constantly accused the anarchists of lying about involvement in criminal activity and alleged that they would be conducting follow-up police action against one of the detained anarchists. In addition to this, SO15 officers asked a number of inflammatory, irrelevant and offensive questions, including ‘what would you do if someone raped your mother?’ evidently in an attempt to cause emotional upset and illicit angry or violent responses. One member (28) who did not want to be named for fear of reprisals from the police, said “We were treated like criminals. I told them I went to the congress as I am an amateur journalist and I write articles about activism. They saw my note book, camera and Dictaphone but they said I was lying.” One officer said ‘You said you are an anarchist, I’ve seen anarchists on the news, they are violent, throw molotov cocktails and disrupt people’s lives not write articles”. The counter terrorist officers either didn’t know or chose to ignore that, during the first day of the gathering, the International of Anarchist Federations (Of which the UK Anarchist Federation is a member) had issued a statement rejecting all terrorist tactics as a means of achieving an anarchist society. In contrast to the actions of the UK security forces, the local press and residents in St.Imier reported very positively on the anarchist gathering. With this incident, we are seeing a further slide towards political policing and the criminalisation of political ideologies. The two detained anarchists have not had any involvement in any illegal or violent activity, or any activity that would concern the counter-terrorist police. As in the past, when Metropolitan police called on people to give information about local anarchists ( Anarchists should be reported, advises Westminster anti-terror police | UK news | The Guardian ), anarchists suffered harassment for their political viewpoint. As class-struggle anarchists, we believe that the state does little except serve the interests of the rich and powerful at the expense of ordinary people. This is seen clearly when people who hold views critical of the state are treated as criminals and terrorists. We seek to create a classless society, based on freedom, equality and co-operation. We believe in the capacity of ordinary people to run society themselves, without the interference of bosses or politicians. 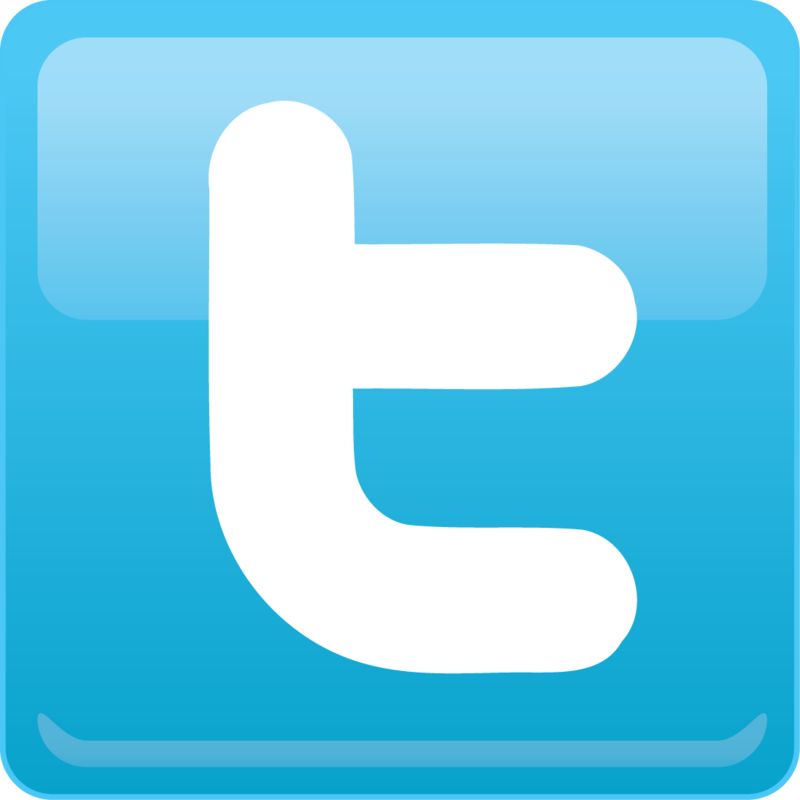 This incident was not in response to any crime and constitutes repression and criminalisation of a political ideology. Tuesday found a Massachusetts man guilty of conspiring to support al Qaeda by translating Arabic messages and traveling to Yemen for terrorism training. Tarek Mehanna, 29, was found guilty on all seven counts against him and faces the possibility of life in prison. The U.S. citizen was arrested in 2009 and charged with “providing and conspiring to provide material support to terrorists.” He was also charged with conspiracy to kill in a foreign country and lying to law enforcement officers. Members of his defense team called themselves “extraordinarily disappointed” with the verdict and said they will appeal.